The core mechanics hold old ties from the classic arcade shooter “Super Pang” where you shoot vertically, but with modern day twists. You are Harry, a brash and tenacious exterminator who has a knack for decimating bugs. Harry’s current assignment takes him to an infested futuristic research facility on a distant planet. The surviving and dwindling number of scientists employed him for his slaughtering skills. Harry’s mission: survive until the decontamination of the building is complete, hoard coins like his life depended on it, and protect the scientists at all costs. Watch out for the spiders they have a particular fondness for rubber encased scientist brains. After landing, you will move from room to room through the facility blasting rockets, lasers, and wielding the power of lighting upwards at anything not human. Ravenous swarms and ferocious waves of bugs of every size will attempt to kill you, but luckily there will be weapon and health pick-ups to aid Harry on his quest. Fierce reflexes are mandatory for survival, but Harry’s brutal power-ups will let the guts fly and make the larva cry! If you love games with humor, perfect platforming, grotesquely cute art, nightmarish bosses, and real personality then The Bug Butcher will suit your fancy. The Bug Butcher was originally developed by Awfully Nice Studios composed of former Blizzard duo Till Aschwanden and Rainer Zoettl. This crazy shooter was released on 2016 on PC and consoles to rave reviews with an average metracritic over 80 and 89% on Steam reviews. 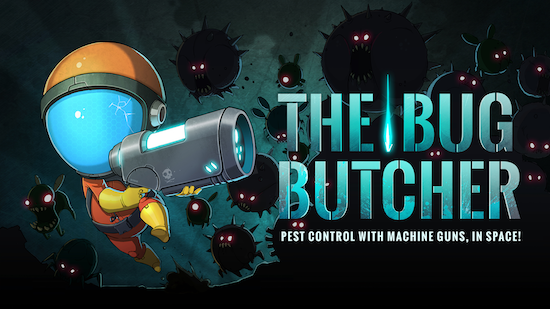 The Bug Butcher has won several awards such as The Big Indie Pitch at GDC Europe. It has been praised by press such as Destructoid who said in their review "this game has seeped into my mind. It only took a few short hours." 2Awesome Studio is now proud to announce our partnership with Awfully Nice Studios to bring The Bug Butcher to Nintendo Switch during the summer of 2018. 2Awesome Studio has ported the game to the Nintendo Switch taking care of bringing every detail to the last sprite to Nintendo's console. Obviously adding features like local co-op anywhere anytime with a single console and a pair of joy-cons, and online leaderboards. Developed by Awfully Nice guys, ported and published by 2Awesome dudes. Can't get better than that!